Becker at the 2018 FIFA World Cup in Russia. 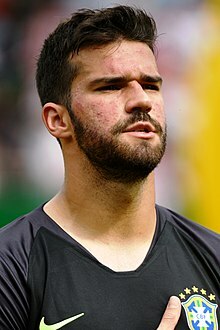 Alisson Ramses Becker (born 2 October 1992), also known as just Alisson, is a Brazilian professional footballer. He plays for Premier League club Liverpool and the Brazil national team. He plays as a goalkeeper. He was born in Novo Hamburgo, Rio Grande do Sul. Becker began his career at Internacional. He made over 100 appearances and won the Campeonato Gaúcho in each of his four seasons at the club. In 2016, he signed a €7.5 million transfer to Roma. In July 2018, he signed for Liverpool for a fee of €72.5 million (£66.8m), a world record transfer fee for a goalkeeper. Becker has played for Brazil since 2015. He played for them during the Copa América Centenario in 2016 and the 2018 FIFA World Cup. ↑ "Alisson: Liverpool make Brazilian world's most expensive keeper". BBC. 20 July 2018. Retrieved 22 July 2018. Wikimedia Commons has media related to Alisson Becker. This page was last changed on 24 March 2019, at 21:48.